Doug Stirling is perhaps best known for his highly successful reinvention of the LS3/5A, which he developed with expert assistence from no less an authority than Derek Hughes. The BBC-approved "V2" marked the beginning of a lasting partnership between Doug and Derek, of which the SB-88 is the latest offering. Back in 2011, Stirling released the LS3/6. This is a very successful reinterpretation of the original BC1/LS3/6 design, but obviously this is a large loudspeaker that might not be appropriate for all domestic settings. The new SB-88 is Doug's answer to this obvious discontinuity in his product range, sitting neatly between the LS3/5A V2 and the LS3/6. Naturally, the design is once again by Derek Hughes. The drive units are straight from the LS3/6, sans the super-tweeter. Of course, the modern tweeter is more than able to cover the top octave with no help from a super-tweeter, but in the case of the LS3/6, the super-tweeter was needed to match the original design - remember that the Celestion HF1300 didn't go much beyond ~13kHz. The result is the classic 8" bass-mid plus 1" tweeter configuration that was so popular - for good reason - before narrow floor standing designs because the norm. The drive units are custom-made by SEAS to Stirling's specification. The polypropylene bass driver has a modified dust cover and a doped diaphragm. The chassis is die-cast aluminium with a very "open" design that maximises airflow and avoids cavity resonances. Overall, it is an extremely fine performer. I'm not sure what modifications are made to the tweeter, but it carries an OEM part number, so you would need to source replacements from Stirling Broadcast directly in the unlikely event of failure. Naturally, should this happen, the complete loudspeaker should be returned for measurement and calibration (as you'd expect, every loudspeaker is measured and auditioned before leaving the factory). The crossover from the LS3/6 has of course been re-worked for this loudspeaker, but has much in common with that network. 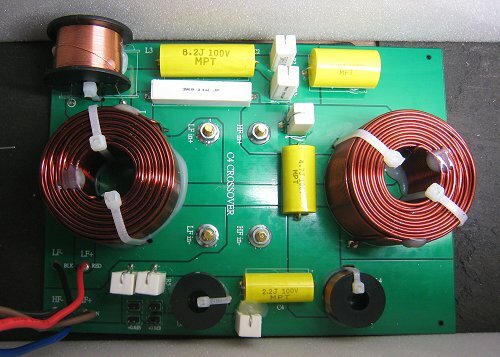 Very high quality components are used, and the design is necessarily complicated. Minimalist crossovers are rarely feasible in high quality loudspeakers, despite what the Marketing departments might say! In common with all Stirling Broadcast loudspeakers, "buy-wiring" is provided for via high quality binding posts. Gold plated shorting links are pre-installed - it is worth checking the binding posts are done up tightly from time to time. Needless to say, as this is a product that is in current production, I'm not planning to reverse-engineer the crossover schematic. This photograph, taken in situ, tells the story sufficiently well. The cabinet is slightly simpler than the LS3/6. Yes, it still uses high quality 9mm birch ply (15mm for the baffle), and yes, the panels are damped with the same modern compound that replaces the bitumen-impreganted felt pads of yesteryear. But this cabinet adopts the more usual approach of fixed front and rear panels, with access to the internal components via the bass driver aperture. The so-called "lossy" cabinets, with their screwed on front and rear panels, might have subtle performance benefits, but they seriously increase the complexity - hence cost - of construction. I don't know if lossy cabinets were auditioned during the development of this model, but I'd be very interested to know what the subjective differences might be. I've certainly heard a lot of positive feedback about lossy cabinets from LS3/5A users (all of Doug's LS3/5A cabinets are lossy), but the LS3/5A is well-known for being an extremely tempermental beast! Anyway, whatever the details, they are clearly of a very high quality - Stirling uses a UK cabinet maker that supplies many of the big names in the UK hi-fi industry, and the fit and finish is first class. Styling is very much in the classic BBC idiom, with just a gently sculpted profile to the grille frame that (literally) takes the hard edge off the functional lines. The grille frame is machined from a single piece of 9mm birch ply. This brings me to my only criticism of the construction of the SB-88, and the LS3/6 for that matter. The plastic pegs used to retain the grille grip tenaciously, and it is very difficult indeed to remove the grille. Yes, the units were voiced with the grille in place, and since having children, I'm a believer in keeping grilles firmly in situ, but for those who do wish to remove the grilles - and as the baffles are veneered, I can understand why you'd want to - then you will have something of a struggle on your hands. Something like decorating scraper with a wide blade is the ideal tool to assist removal, but be very careful to avoid marking the inside edges of the side panels when you do this. Perhaps with age, the plastic poppers will soften their grip. Once the grille is off, you'll see that the woofer is front-mounted - unlike the LS3/6, which has to be rear-mounted like the original - and it sits in a nicely machined recess that leaves it flush with the front edge of the baffle. Of course, the tweeter is similarly countersunk. Both drivers are secured with M4 hex-head machine screws that connect with metal inserts in the baffle, and gaskets ensure an air-tight seal. My first listening tests were done via my level-matched A-B comparison box, which feeds the four identical power channels in my A4 power amplifier. This is an excellent way to quickly compare loudspeakers, as the instantaneous click-free transition somehow magnifies differences that you could easily forget in the time it takes you to swap loudspeakers over. For some time now, this has been a standard part of my test regime. After a few hours of listening like this, I then remove the other loudspeakers from the room, and run my amplifier in bridged mode, which adds a lot of headroom. Prolonged listening to one pair of loudspeakers in isolation allows you to really get to know their strengths and weaknesses in a way that might not be apparent in a quick A-B comparison. Initially, I set the SB-88s up next to the LS3/6s and started playing a selection of well-worn favourites. Switching between the two was very revealing. I really didn't know what to expect. Of course, Derek Hughes could have delivered whatever type of sound that Doug asked for, but neither Derek or Doug were prepared to comment before I'd had the chance to listen to them. So would they produce the classic "BBC monitor" sound, or would they sound rather more "modern", or "user friendly"? Remember; not everyone is ready for the truth! Well, happily they went for the former; they sound almost exactly like the LS3/6. Perhaps that's not completely surprising, but having the same drive units and designer doesn't guarantee anything: after all, most of what you hear is the system design. Until I get around to finishing my LS3/6 review, it might be worth expanding a little bit on how these actually sound. Basically, both the SB-88 and the LS3/6 produce a wonderfully neutral midrange that is easily the equal of the best of the designs to emerge from the BBC school of monitor design. But unlike the older designs, you don't have to live with compromises elsewhere in the spectrum - think Spendor BC1 without the problematic bass end! OK, so there are differences. The midrange is slightly different; there seems to be fractionally less energy in the 2-3kHz region, which makes the sound slightly warmer compared to the LS3/6. Vocals are slightly better on the LS3/6 - the separation between them and the rest of the mix was subtly improved, and it was easier to separate out the individual components of multi-track harmonies. Likewise with massed strings and brass. The SB-88 did these things extremely well, but the LS3/6 just edged it. The treble from both is especially fine; nicely extended, but with no hint of excess or other artefacts. In fact, this comparison usefully demonstrated just how well the super-tweeter is integrated with the main tweeter in the LS3/6. Both image effortlessly, provided some care is taken with the room layout. Initially, the left SB-88 was slightly behind the left LS3/6, and this caused the stereo image to become very indistinct, with a definite bias to the right channel in the HF. Moving it forward just an inch or two fixed this, and later tests with just the SB-88s in the room improved the imaging once again. Really, there is nothing to fault here - a perfect picture with nothing drawing attention to itself - the loudspeakers simply disappear. Which, of course, is the hallmark of a well-balanced loudspeaker that has low levels of colouration. The surprising thing is the bass. I would have expected the smaller SB-88 to have noticeably less bass extension, but from an initial listen, that simply wasn't the case. Extended listening revealed that yes, the bass from the LS3/6 is slightly more extended, and marginally smoother, but in my relatively small listening room they were a lot closer than I expected. A quick look at the impedance curve revealed that the ports are tuned to 45Hz in the SB-88 and 40Hz for the LS3/6. 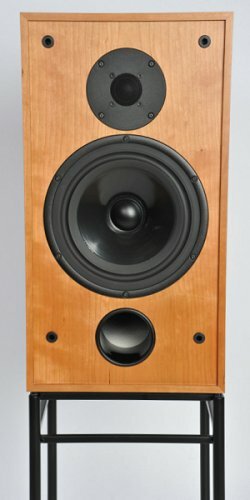 Away from the LS3/6, how do these compare to other loudspeakers? For me, the obvious test is the ATC SCM20SL, which have been my reference for many years. Now, much as I love them, the ATC isn't perfectly flat across the band - they are a trifle forward in the upper midrange, and they are slighly bass-light unless placed near to a rear wall. Of course, the quality of the bass from the sealed box is outstanding, and for me is the reference against which all ported contenders must be assessed. I'm pleased to report that the SB-88 compares extremely well. The sytem has been extremely well tuned, and the port rarely draws attention to itself. With most material that I tried, I really couldn't identify any problems at all - the bass was well extended and there was no sign of "slowness" caused by excessive group delay (something which can be readily identified with my old Rogers LS7s on certain electronic programme material). These (and the LS3/6) have caused me to re-evaluate my stance on ported enclosures - of course, as with any approach, it's all in the implementation. While the ATC has the edge on midrange resolution, the SB-88 is smoother and easier to listen to while giving up relatively little in terms of transparency - it's most definitely a "monitor-class" loudspeaker. When playing poorer quality recordings, the SB-88 is more forgiving while retaining almost as much insight. In other words, the Stirling is an easier loudspeaker to live with. Taken in isolation, the SB-88 is a very successful take on the classic BBC monitor format which offers the sort of performance we've come to expect from Derek Hughes over the years - true transparency with no need to resort to the hackneyed treble-lift "trick" to give the false illusion of detail, combined with the sort of tonal neutrality that is very rare these days. But when compared to the LS3/6, might the strong showing from the SB-88 present an unexpected problem for Stirling Broadcast by tempting away prospective purchasers of the LS3/6? Yes, the LS3/6 is a better loudspeaker, as prolonged listening tests prove. But both models are extremely good, and both offer real value for money. If I couldn't afford the LS3/6, then I'd be delighted with the SB-88; they really are that close. I'd advise that you try to audition them both, as ultimately, it'll be the size of your listening room that determines if it's worth streching to the larger LS3/6.